A lot of you know that I contribute to my local morning show here on fox4kc, well on Wednesday I went on the show with 3 other creative contributors and participated in a white pumpkin challenge. We were all asked to decorate a white funkin and come reveal it together on the show. 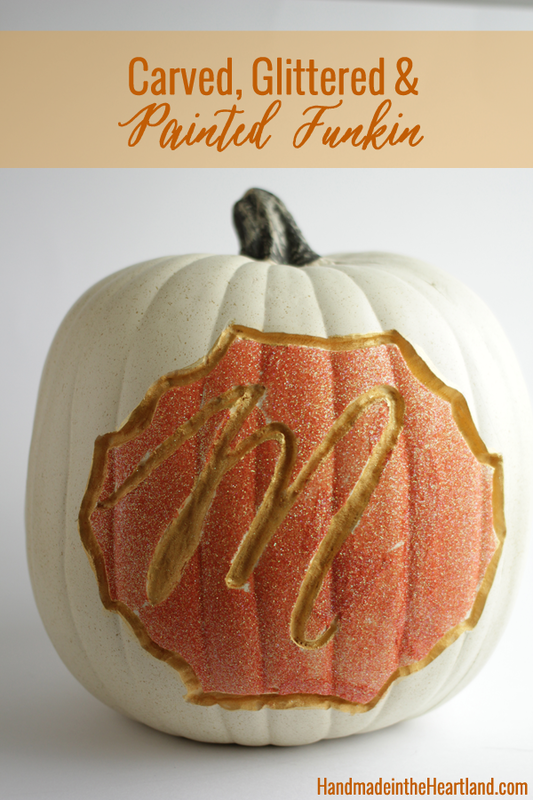 For the challenge I created this carved, glittered and painted funkin with our family initial. The other contributors were awesome, you can see the whole segment HERE. 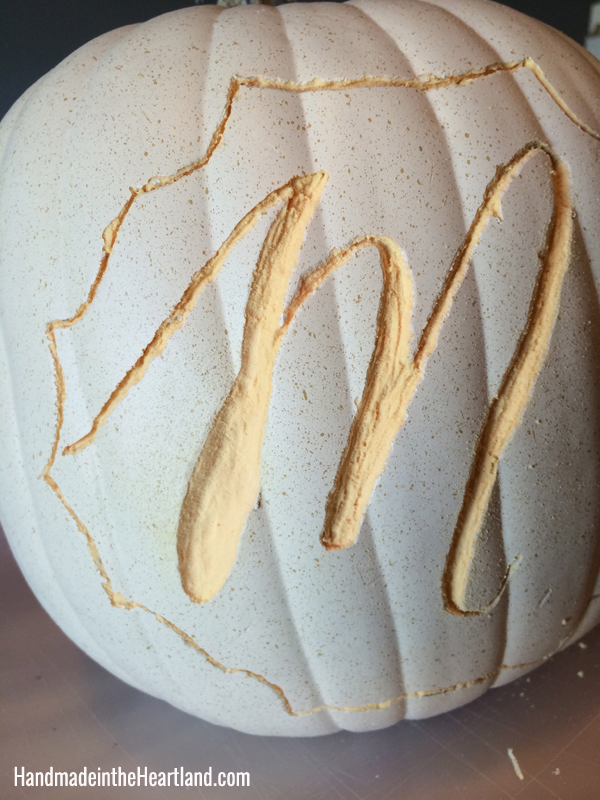 I had so much fun carving and deciding what to do that I think I might go buy a few more! I love that whatever you carve into these guys you can keep pulling out year after year, isn’t that the bummer with carving real pumpkins- that after a few weeks your creation is gone?! Keep reading for all my tips! 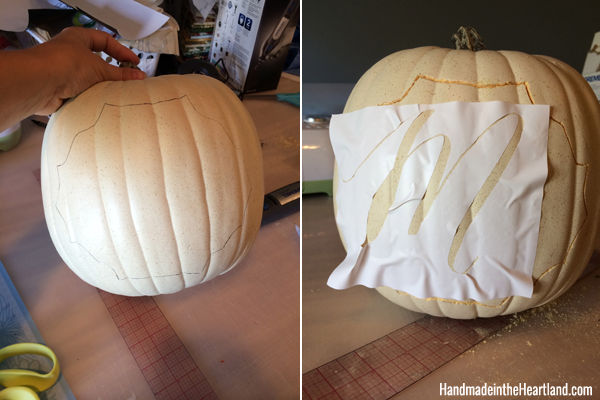 The first step is to decide what design you want on your pumpkin. I used my Cricut to cut out vinyl sticker stencils. And then using a pencil, I traced the design and then took the sticker off. 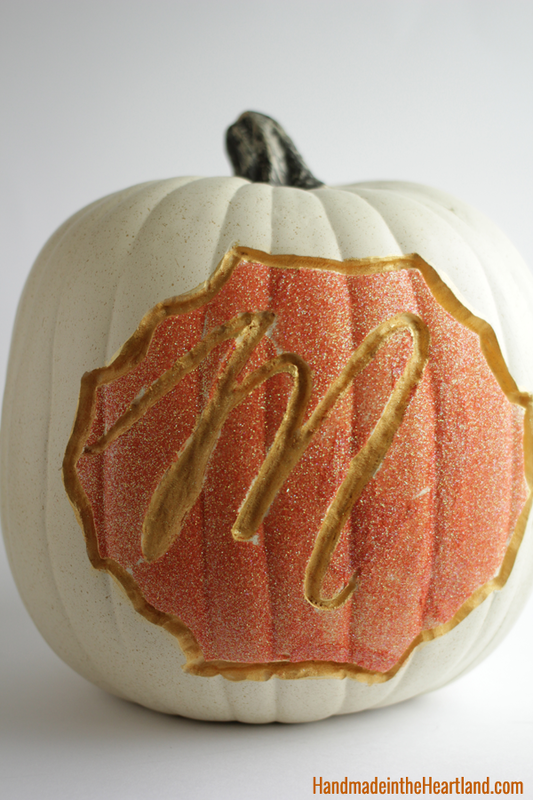 I decided to have an M for our last name on our pumpkin but it’s completely customizable. Do whatever design you want. You can even freehand with a pencil. 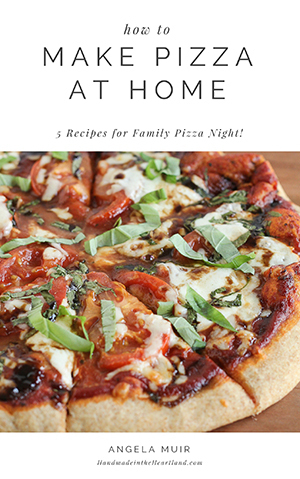 You don’t have to have a stencil. I used my awesome Dremel micro to carve my funkin. 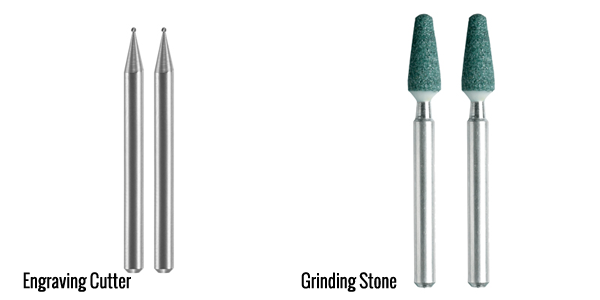 I used two different attachments, the engraving cutter and the grinding stone. And I preferred the grinding stone. It gives a smoother texture to a larger area. It’s amazing how easy it is to carve funkins, especially with a Dremel. 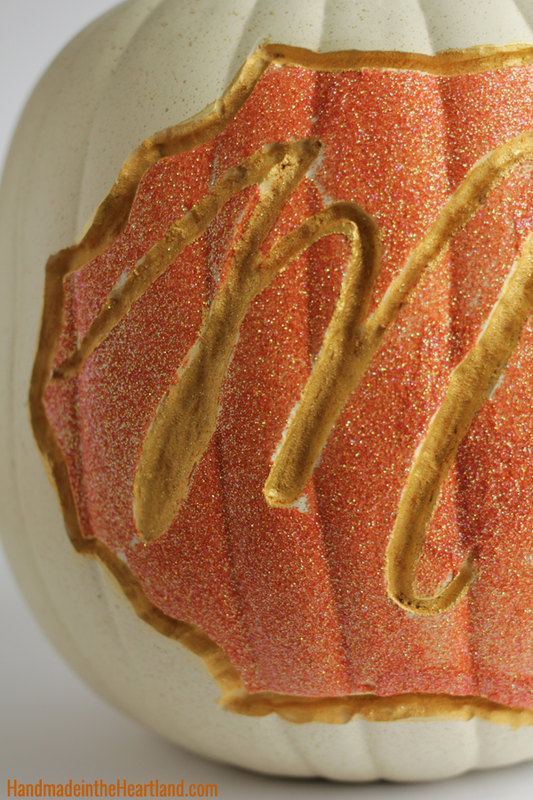 If you carve out a hole in the bottom of the pumpkin, you can light it with a lamp kit or christmas lights. You can see the difference in the different attachments below. 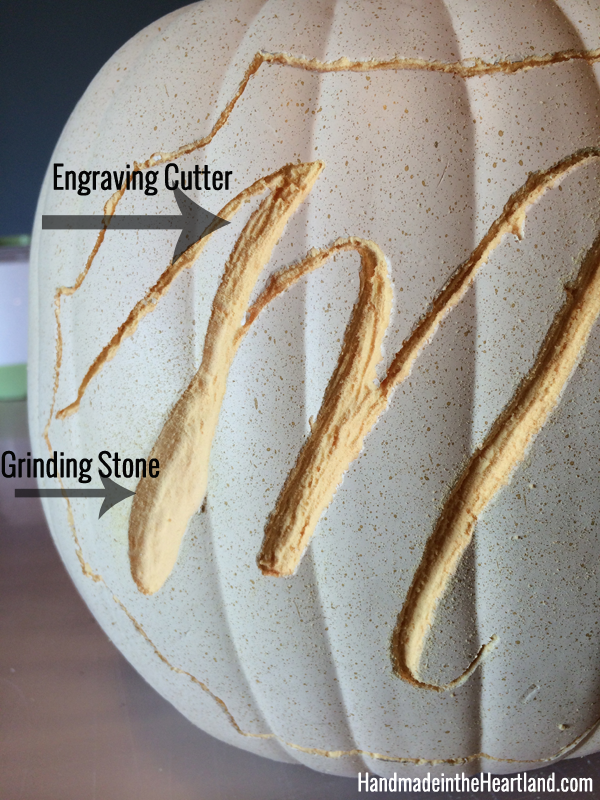 I started with the engraving cutter and then went over it with the grinding stone. I don’t mind spending time on decorating the funkin, because I will be able to pull it out year after year. After the engraving I added glitter by painting glue on with a paintbrush and then sprinkling glitter over it. For the final touch I painted inside the engraved area. I’m super happy with how it turned out! How would you decorate a funkin? I’d love to hear in the comments! I’m thinking I need a few more – once you do one your creative wheels start turning!